Don’t miss out on the best kept secret of the West Coast: Velddrif. Stay at the holiday home Quay West, just 40m off the Berg River (2nd row). This brand-new 2 bedroom upmarket self-catering house has opened its doors recently. It is ideal for the discerning traveller to relax and experience quality time in homely atmosphere. Launch your kayak, enjoy a boat trip, watch the birds in the estuary, taste some fantastic seafood delicacies or just chill…here you can recharge your batteries from the hectic city life. 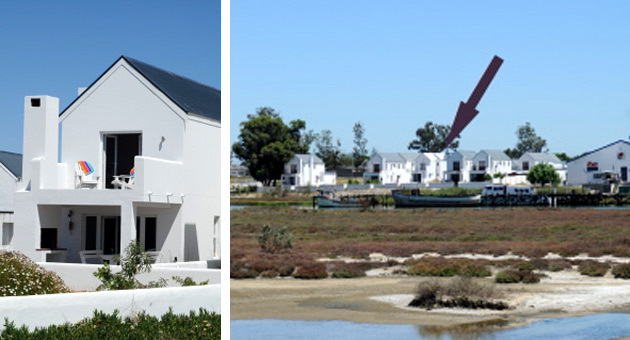 Quay West is a cosy self-catering upmarket lock up and go holiday home situated in Velddrif Quays close to the Berg River (approx. 40m, 2nd row). The bottom level of the house consists of a guest toilet, an open plan kitchen / dining and lounge area which is leading to an outside patio with braai. Families and friends can enjoy quality time together. The top level hosts the Master bedroom with Queen Size bed, dressing room and spacious ensuite bathroom with toilet, basin and huge shower/shower panel. It leads to comfortable balcony for sunbathing. The second bedroom with extra lengths single beds converted into King Size bed also has its own ensuite bathroom with shower. The balcony has limited views onto the Berg River. The “home from home” is fully-equipped with dishwasher, washing machine, microwave, fridge/freezer, oven and hob, coffee maker, kettle, toaster, hair dryer and safe. Bring your own iPod and connect to the Hi-Fi for entertainment. A double kayak is available for our guests at little extra charge. 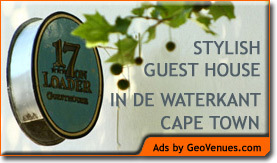 And for great Guest House Accommodation in Cape Town, stay at 17 on Loader Guest House, in de Waterkant.